Let's get started, we have some future planning to do! The great thing about this is all you need are 2 things… a notebook (it doesn’t matter what kind although I always prefer notebooks with numbered pages) and a pen/pencil. You may wish to use a third item to get your lines nice and straight… you guessed it… a ruler. This can be a sneaky third item but not necessarily needed. So, go ahead….grab your pen/pencil and your notebook and flip to the first available double page spread and begin drawing in your 12 columns (1 for each month). 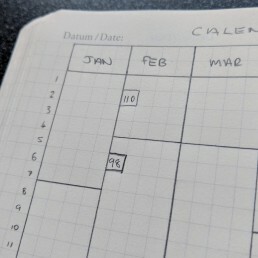 Depending on how much space you want to include in each column you of course will need to adjust the width to suit remembering to leave a gap big enough on the left of each page so you have space to write down the days of the month… 1st – 31st. Some notebooks come with an empty index at the beginning; this is the case in my notebook of choice the Leuchtturm 1917. It’s a good idea to draw your Calendex on the first available double page spread. You’ll notice I have separation lines in each column; this is to break down the months by weeks. So if there is a horizontal line spanning the width of the column, it means that the row above the line is week ending Sunday and the row below the line is week beginning Monday. Also, I have diagonal lines at the bottom of some monthly columns. Obviously, not all months have 31 days so this is a simple method to show when the month ends. In the example below the Feb column ends on the 29th as it is a leap year next year. In this example, I use a double page spread (you may use a single page if you wish). The first page is broken up into 6 columns, each column representing a month January through to June. On the next page, you have another 6 columns from July to December. It really is as simple as that. As I have said previously the Calendex is not just simple but flexible too and to show just that, check out our article on seting up a pocket notebook Calendex. This is the Calendex in its purest form but I have seen many full of colours, stickers and fancy fonts galore. So go nuts and don’t be scared to experiment and get messy. 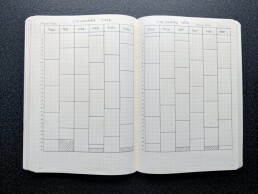 If you’d like another reference post you can find it featured on the Bullet Journal blog.